Dive Journal: Kay almost apologizes at selecting this dive site, since it is located very close to the harbor and is in relatively shallow water. But I think he likes the calm conditions here. It turns out to be one of our best dives in Yap! Jennifer is really cold after her repeated diving here without a wetsuit. She has tried to secure one from the dive shop but they indicate that none are available. That seems curious. This morning they’ve finally fixed her up with one that is too large, and so it allows alot of flowthrough. 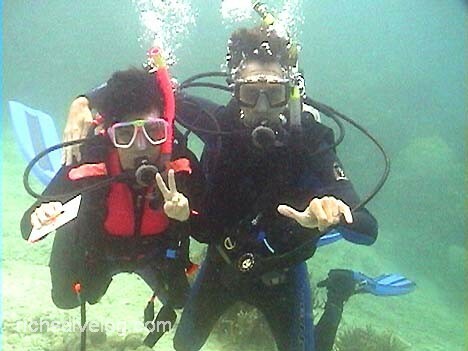 In any case, Linda and I are extremely glad we’ve brought and worn our 3mm suits on every dive. Comfortable! I’ve sorta made up this site name because I think I heard one of the divemasters say it. The dive starts out at Buoy #1 (or Buoy #2) and you follow a shallow sloping ridge to the other buoy. The dive is known as a macrophotographer’s delight, since there is an excellent variety of smallish critters. I should probably call it 1-2 MacroDive. We immediately spy a dozen or more patterned sea cucumbers inching along the bottom. These ones curiously have brown leaves stuck all over them. Jennifer has fun “cleaning” one off for me and I get a video closeup of its pretty skin.. There are four great starfish on this dive, a red one, a blue one, a patterned one, and a crown-of-thorns. We love the humbug dascyllus and staghorn majors. There are several beautiful nudibranches, and a fascinating scribbled pipefish. Visibility is not great, but for the closeups it doesn’t make too much difference. I get some video of both a bicolor angelfish and a dusky angelfish for the first time. At one spot there is an execellent setup of a gold-streaked shrimpgoby and codependent shrimp. At another we see a large sea turtle flee from us into the murk. Buried in the staghorn corals, we also see loads of gorgeous pajama cardinalfish. Near the end of the dive, Linda and discover a lionfish hanging upsidedown in a cavern. We’ve mostly seen lionfish at night, when I was not taking any video, so I enjoy getting a few shots of him. There are also two honeycomb groupers that perch for me. Just below the boat, we really enjoyed the clouds of blue-and-green chromis dashing in and out of the corals. Just before we ascend, Alberto grabs the camera and shoots a few frames of Linda and me, a nice momento. It’s our last dive in Yap :(. Our 10 days of nonstop diving has made us pretty exhausted but we have loved every minute of Micronesia. This list was created by looking over the video footage and identifying each species.